Another long week has passed at restaurant Noma. It has been an absolute whirlwind of new flavors, smells, and experiences. Had a wonderful start to my day as my roommates presented me with a traditional Danish birthday song and a cake! Layers upon layers of light airy thin Danish pancakes. Each cake was slathered with Nutella and a blueberry cream, then dotted with sliced bananas and coconut. Quite scrumptious indeed. 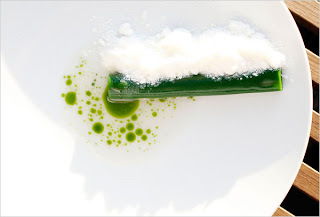 The razor clam is paired with a mussel juice reduction, dill oil, and horseradish snow. This dish is pretty incredible when tasted. I must admit I wasn't convinced on this one at first. I had tried the individual components and just wasn't impressed. Each component on it's own tasted quite ordinary. The plate in total however is mind blowing. Beautiful, clear, and straight forward flavors. So bright and alive. The kick of the horseradish plays great against the sweet razor clam while the mussel stock offers a briny shellfish base. The textures are captivating and fun. Of course, the presentation is stunning. This one is a Noma classic and one of my favorites so far. Three new dishes have made it to the menu this week, something that is very exciting for all the staff. It's very unusual to find a restaurant of this caliber that changes its menu as often as it does. For instance, The Fat Duck still has the same menu they had three years ago aside from one item. First added is an Oyster in Pot dish. A large blue Le Creuset pot is filled with beach rocks, three different types of sea weed and sea moss, mussel and clam shells, and sea water. The entire pot is heated before it is sent so that when the lid is lifted scents of the sea waft towards your nose. A surreal sensation. It was actually pretty cool because when Rene was describing the dish to the staff he says "I want it to be hot. I want the guest to burn themselves a little on the lid. Those are the things that have been stripped from food, those physically moving moments." A beautiful plump Danish oyster is dipped for one second in a pot of boiling water, just to quickly seize up the proteins. It is sliced into four pieces and placed in the shell on top of the rocks. Next, a teaspoon of warmed milk and cream is spooned over. A shaving of horseradish, elderberry capers, and tapioca pearls that have been steeped in apple cider vinegar come next. The oyster is then garnished with sorrel, water cress, and winter cress stems, parsley leaves. The flavors are natural and real. Makes a huge impact in ones culinary database that will never be forgotten. The next dish is the Egg Tableside. A small cast iron pan is heated right on the plancha. An infrared thermometer measures when the pan is exactly at the right temperature. The pan is sent to the table with a farm fresh duck egg, sea salt, hay oil (created by toasting hay in the oven at 170c for 1 hour, it is blended for 3 minutes with rapeseed oil, steeped overnight, and strained), thyme butter, ramson sauce, fried potato curls, and various herbs (Ground elder, Onion Cress, Lemon Thyme, March Leaves, Kodriver, and Winter Cress). All of this is brought to the table on a bed of hay. So those are the new guys. Other than that, it's been the same hard driving focused and detailed work everyday. Rene is a very smart and creative chef and getting to listen and learn from him everyday has been an absolute joy. One more important item of note before I sign off for the day. Tomorrow, the San Pellegrino World's 50 Best Restaurant Awards will be held in London England. This is a hugely important event for chefs and restaurants across the globe. Michelin stars practically go out the window when this list is posted every year. The list is compiled by a poll of world renown chefs, restaurant owners, critics, and general food lovers. The results will have a direct effect on the attention, reservations, and status of the restaurant. Noma is currently placed at number 3 in the world. Without jinxing anything, there have been very good rumors floating around and we've heard from several people with actual poll that Noma has nothing to worry about. 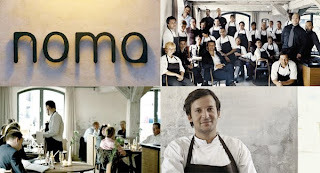 *Here's a link to the website: World's 50 Best Restaurants. The event starts at 7pm my time and runs from the 50th best through to the 1st. It should be around 9pm when we find out (3pm your time). Stay tuned, I'll have the results on both the blog and my facebook page. Keep your fingers crossed! !